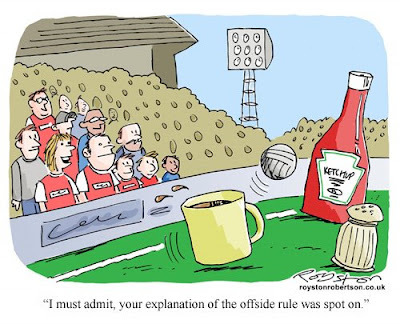 Cartoonist Alex Matthews mentions this cartoon as one he wishes he'd thought of in his Cartoonist of the Month interview over at Prospect magazine's blog. It was in Reader's Digest in 2006. This is one of those that I never had particularly high hopes for when I drew it (I thought it may have been done already) ... so, of course, it is one of the most popular cartoons I've ever drawn! Hey, look! Here's one of those wordcloud thingies from the Wordle site. Everyone else seems to be doing them, so here's one created with this blog feed. Click to enlarge. 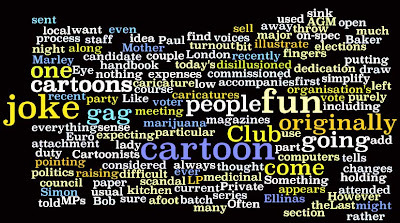 No surprises with most of the words that are prominent, such as "cartoon", "joke" etc. But it's always a bit disappointing that wordclouds highlight such mundane words as "come" and "going". 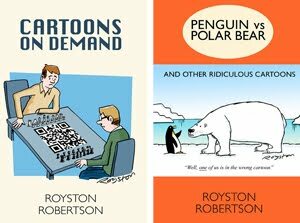 I've ADORED this cartoon ever since I first saw it, Royston. I think it's pure genius and I can fully understand Alex's professional envy!